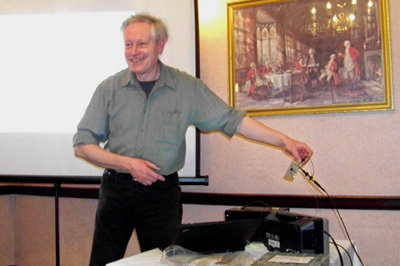 At the LRS meeting on 23rd February we welcomed back Dr Roger Hill MBE who talked about "Circuit & System Technologies". 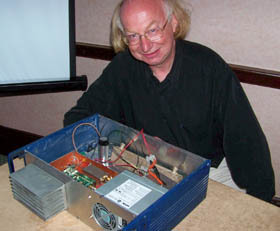 Roger has also made a number of very interesting presentations on cutting-edge technologies in previous years. At the LRS meeting on Wednesday 9th February we were privileged to have a presentation from RSGB Past-President Angus Annan MM1CCR on the new RSGB National Amateur Radio Centre which is currently under construction and fitting-out at Bletchley Park and scheduled to open on 18 April 2011. A full report is posted in the Meeting Reports section. 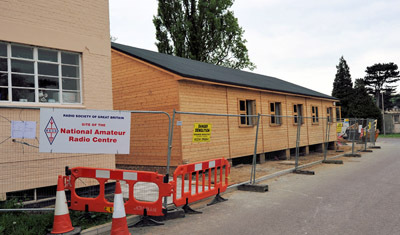 The RSGB National Amateur Radio Centre under development at Bletchley Park, Bucks. (Photo courtesy of the RSGB). 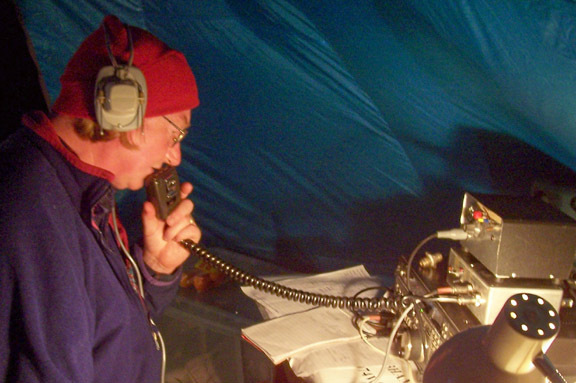 The VHF NFD Report in the December 2010 issue of RSGB RadCom carries the photograph below (from the LRS website) of Brian GM8BJF operating on 70cm. 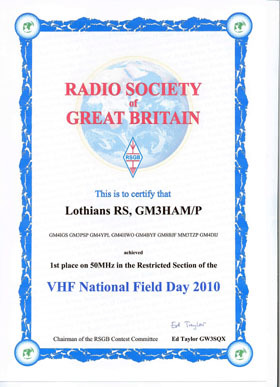 In addition, there is the announcement that GM3HAM/P won the Restricted Section on the 50 MHz band and at 5th place was the highest-placed Scottish group overall in the Restricted Section, retaining the Cockenzie Quaich for a third year. 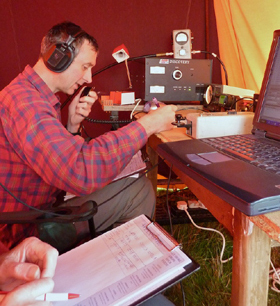 "Lothians RS GM3HAM/P: Brian GM8BJF still working them on 70cm" - RadCom. 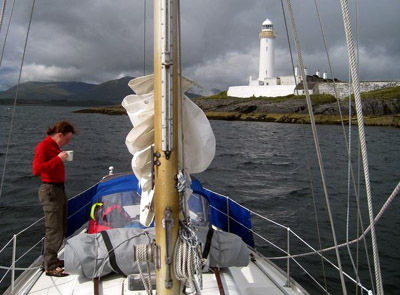 The LRS information leaflet can now be downloaded here for printing and giving to your radio friends. Copies can also be obtained from the secretary at club meetings. 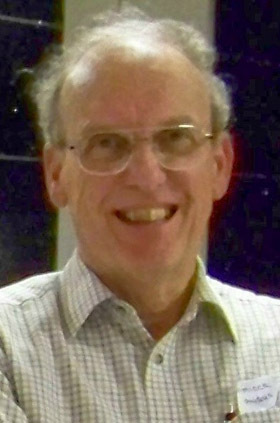 Dr. Brian Flynn GM8BJF talked about "The GB3EDN 23cm Beacon - History and Update" on 6th October. A full report with photographs is available in "Meeting Reports". Brian GM8BJF with the hardware for the new GB3EDN beacon. Photographs of this event by Peter GM4DTH are now available for viewing under Society Activities - Contest-Portable. 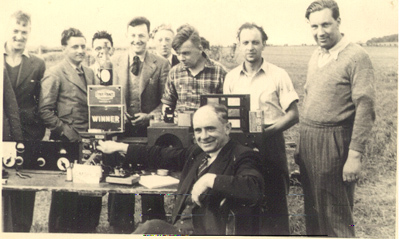 A new Archive section has been created on this website and the Editor - Alan GM3PSP - is working to fill it with photographs and historical data of the Lothians Radio Society. Feel free to send him any photographs etc from the early (or not so early) days of the LRS that illustrate our history as a club. The following photograph of a Field Day in the mid-1950s is the earliest photo we have at present. Most of these guys are identified in the LRS Archive section. LRS Field Day in mid-1950s.